Plus Size Formal Pant Suits and Plus Size Cocktail Pants Suits are a great option if you need to go to a dressier event, a dressy wedding or even for a cruise. They can be the perfect choice when you want to be comfortable but still present an air of professionalism and style for a special occasion. This particular type of suit is ideal for many different occasions ranging from an anniversary dinner or holiday gathering to a wedding or board room presentation. There are great options that range from classic styles to those with sequins and glamour. I love the ones with beading, sequins and flowing duster length jackets. While there is not an abundance of choices, there are some really pretty and elegant ones available. There are two approaches to buying a formal pants suit. One is the mix and match approach. Here you'll be picking out all the elements of a formal suit but not as ONE unit. Rather you're gathering the fundamentals that you need to mix and match, and ones on which you can build your wardrobe easily and less expensively. This approach has the advantage of sizing. 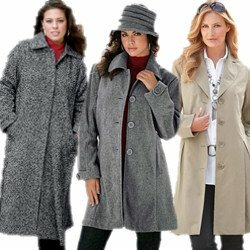 Many plus size women find that while the pants of one suit might fit the jacket or shirt does not (or vice versa). This method allows you to get the best fitting pieces while shopping for great prices. The whole suit approach is the second option. Here the entire suit is already matched and sold as a set. If you like what you see, you can always consult a tailor to make minor adjustments later. A plus size formal pant suit has various elements. It may either have are pants, shirt and a jacket or an embellished tunic and pants. Some dressy pants suits go the extra mile for a vest. Plus size women may wish to avoid the vest because it makes for more bulk. Jackets run in various styles from the ultra-formal tuxedo to something a little less showy like a duster , western style or double-breasted jacket. Determining which one is best depends heavily on your body curves as well as formality of the occasion. If it says black tie - go for the tuxedo! 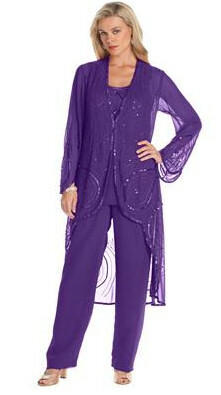 There is a wide range of top and pant styles for formal evening suits for well-endowed women. Your choice is dictated by the formality of the event, as well as your body shape and taste. In reviewing pant options, take your shoes to make sure you're getting a long enough inseam. Avoid anything with pleats or gathers. Stick with a style that has one tidy crease in the front and straight legs but for perhaps a small flair at the bottom. The main thing that sets plus size formal pant suits apart from others I the kind of fabric they utilize. If you like crepe, chiffon or even patina - you're in luck. That's exactly the kinds of fabric designers pair with other decorative elements ranging from sequin to pearls. The end result can be dramatic, romantic or very official. The key here is choosing an entire ensemble that not only looks fantastic but suits your personality and the tenor of the event. Online stores have the best selection of Cocktail Pants Suits around the holidays - if you are able to shop in advance, that is definitely the best time to pick up your special suit. This season, separates are much easier to find than sets. Find the top you love and then add a great pair of evening pants - the biggest trends right now are chiffon and velvet. Palazzo pants the most popular special occasion pants. Because the retail stores only have limited selections most of the year, here is where you will find the best selection.